CEBU CITY--WBO minimumweight champion Donnie Nietes admits that he has gained a good number of friends from Mexico, as well as a large following among Mexican fans, but the will to win on Mexican soil remains a solid resolve for the Bacolod-raised, ALA gym-trained fighter. In facing the media last night to announce his trip to Mexico to defend his title against Mario "Dragoncito" Rodriguez, the 28-year-old Nietes, who was accompanied by trainers Edmund and Edito Villamor, informed that he aims to get yet another win in the lion's den which would allow him to match if not surpass Ben Villaflor as the fourth longest-reigning Filipino world champion next only to Flash Elorde, Jesus Salud and Luisito Espinosa. 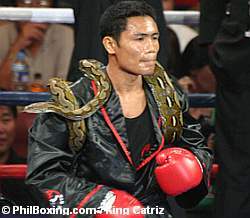 Nietes is the half part of the Philippines' only two current regular world champions, the other one being superstar Manny Pacquiao who holds the prestigious WBO welter crown. "Every time I get into that Mexican ring, and each time I hear of the Mehicano chants for my opponent, I just think that it's me they are cheering on for," said Nietes when asked of his thoughts of fighting on enemy territory. Nietes is set to depart today for Manila with trainer Edmund Villamor where giant network GMA-7 will do footages of him working out. The network will air the Nietes-Rodriguez showdown "live" on August 15 straight from the fight venue, the Polideportivo Centenario in Los Mochis, Sinaloa, Mexico. GMA Network Television has recently inked a deal with Nietes to show the latter's fights to the boxing hungry Filipino fans. This development would impact such a fighter like Nietes who has been inexplicably under the radar considering his accomplishments he has achieved not only for himself but for the Philippines as well. Nietes and Villamor will then depart for Los Angeles on July 24 and will work out at the famed Wild Card Gym where they plan to do the finishing touches of their sparring sessions, which will consist only of four-rounders against whoever is available at the Wild Card. "Then they will proceed to Mexico on August 10," said Aldeguer, who also informed that Mexican ring legend Erik Morales will be the promoter of the show. Aldeguer, Edito Villamor and ALA marketing chief Dennis Canete are scheduled to follow the group to Mexico in August. Nietes (26-1-3, 15 KO's) will be making the fourth consecutive defense of the WBO title in Mexico against Rodriguez (10-5-3, 7KO's).